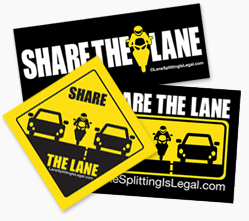 We got a call from the folks at ABC 7 in San Francisco, asking if we’d like to come talk about lane splitting on an upcoming segment about “sharing the road” on Beyond The Headlines with Cheryl Jennings. Talk about lane splitting? On TV? Of course! So here’s Surj talking with Cheryl, wearing the only LaneSplittingIsLegal.com shirt currently in existence. HUGE thanks to Rod from Fairfield for taking time out of his Sunday to get us this clip. We’ll post the entire show shortly.